Why Don’t Prime-Age Workers Feel Like Working? According to many economists, the economy is at or near its full employment level of output; see, for example, the San Francisco Federal Reserve President’s recent comments. Those of us who dispute this contention point to data points like the unusually high share of the workforce that is working part-time involuntarily or the unusually low quit rates. The current levels for these and other commonly used measures of labor market tightness are not consistent with full employment. But the most important reason that we are reluctant to accept that the economy is at full employment is that a much smaller share of prime-age workers (ages 25–54) are employed today than at the business cycle peaks in 2007 and 2000. For men, the employment to population (EPOP) ratio is down by more than 3.0 percentage points from the 2007 peaks and by more than 4.5 percentage points from the 2000 peaks. For women, the drop is 2.0 percentage points against the 2007 peak and more than 4.0 percentage points against the 2000 peak. Those proclaiming full employment dismiss these numbers and attribute them to longer term, non-cyclical, trends. The problem is that the data don’t fit prior trends. Before 2000, the EPOP ratio for prime-age men was on a very gradual downward trend. It dropped 0.9 percentage points from the business cycle peak in 1989 to 2000, 11 years later, a rate of less than 0.1 percentage points per year. For women, there was a continual upward trend through 2000; the EPOP ratio gained over 3.0 percentage points since 1989, or roughly 0.3 percentage points per year. But the recession in 2001 pushed down the EPOP ratio for both men and women, and neither has ever recovered. The Great Recession in 2007–2009 was another severe hit on top of that. 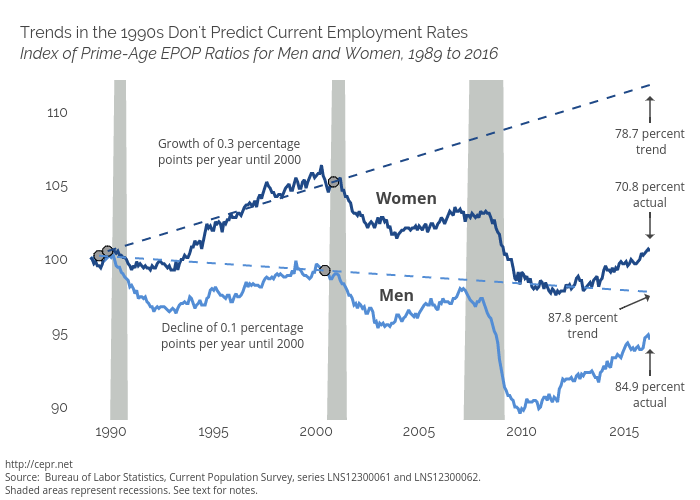 If we want to say that the drop in EPOP ratios for prime-age men between 1989 and 2000 was part of a trend, then if this trend continued at the same pace, the EPOP for prime-age men would be 2.9 percentage points higher than it is today. If the upward trend for women had continued after 2000 then we would expect the EPOP for prime-age women to be much higher today than it was in 2016. The graph below shows the prime-age EPOP ratios for men and women, indexed to their values in 1989. The graph compares the actual values with the trends until 2000 extrapolated to the present day. So we have two alternative stories. One is that for unexplained reasons, the downward trend for employment among prime-age men accelerated sharply after 2000 and the upward trend for women turned into a downward trend. The other story is that a weak labor market has led to a drop in employment opportunities for both men and women. This second story has a lot of supporting evidence: there is tepid wage growth — suggesting that workers have relatively limited bargaining power and that employers are able to find workers fairly easily — and there has been a large loss of manufacturing jobs since 2000, just to name a few. So it comes down to believing in a weak labor market or the unknown. Take your pick.